The Palitana Jain temple is considered to be the most sacred Jain temple in India. It is located on Shetrunjaya hills in the city of Palitana in Gujarat. 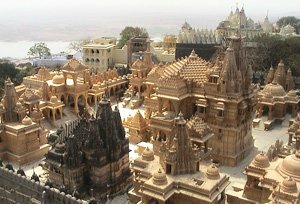 There are altogether 863 Palitana Jain temples made up of marble. The main temple is situated at a height that can be reached by traversing about 3500 steps from the foot hills. The main temple is dedicated to the first Tirthankara, Rishabhanath. The construction of the temples started in the 11th century and is believed to have taken around 900 years to complete. In the 14th and the 15th century these Jain temples were destroyed during the Muslim invasion. The temples are believed to have been renovated about sixteen times since then. These temples have a unique architectural style. The ornamentation is such that in sunlight their appear to have been made up of ivory. One of the temples, Adishwar is considered to be the holiest one among all. The other temples include Sampriti Raj, Adinath, Kumarpal and Bimal Shah. The images of the deity are made up of marble and are beautified by gold ornaments studded with precious stones. The Jain temple of the Digambars is one of the ancient temples. It contains nine shrines with a number of idols of the Tirthankaras encrypted on it. The main temple consists of the idol of Bhagwan Shantinath. This idol is 42 inch in height and is made up of pure white marble. In this temple beautiful idols of Bhima, Arjuna and Yudhisthir have also been also installed.